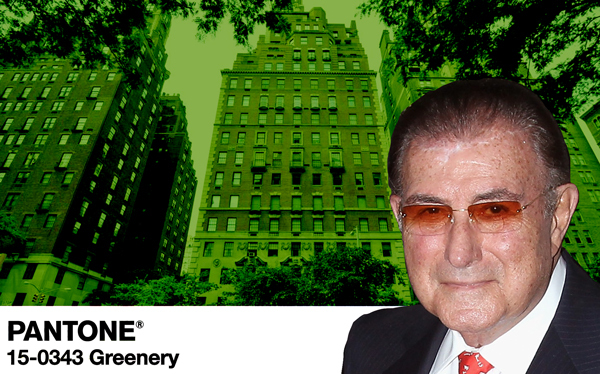 “Greenery” is Pantone Inc.’s 2017 color of the year, and its former CEO is hoping to see a lot of it at 778 Park Avenue. Lawrence Herbert — the printing executive credited with creating a universal color system — listed his 17-room co-op at the building for $39.5 million. The full-floor apartment has 12-foot ceilings, six bedrooms and five baths, according to the listing. Maintenance is nearly $26,000 a month. Brown Harris Stevens’ John Burger and Douglas Elliman’s Eric Friedberg are listing the property. Turnover at the white-glove, Rosario Candela-designed co-op is quite low. Herbert has lived there since at least 1994, public records show. The most recent sale at the 18-unit building was the 15th-floor spread that once belonged to the late broadcasting pioneer Roone Arledge. Viking Global Investor CIO Daniel Sundheim and his wife, Brett, paid $28.5 million for the pad in 2015. In 2011, the couple purchased a duplex that once belonged to the late socialite Brooke Astor. The sale price was $21 million, after a price chop from $46 million.